Up For An Evening Stroll? Five Parks In Pune You Must Check Out! As busy people with hectic lives, we often hide away in the hustle bustle of many and our thoughts get lost in the pollution. Not often do we get time to clear our mind. So, check out these five parks for inner peace! A writer’s retreat, Osho garden is the best place to put pen to paper. Open only from 6am to 9am and 4pm to 7pm, it is the perfect place to witness the sunrise and sunset in absolute isolation. It also houses the Osho ashram where a lot of followers come to worship. 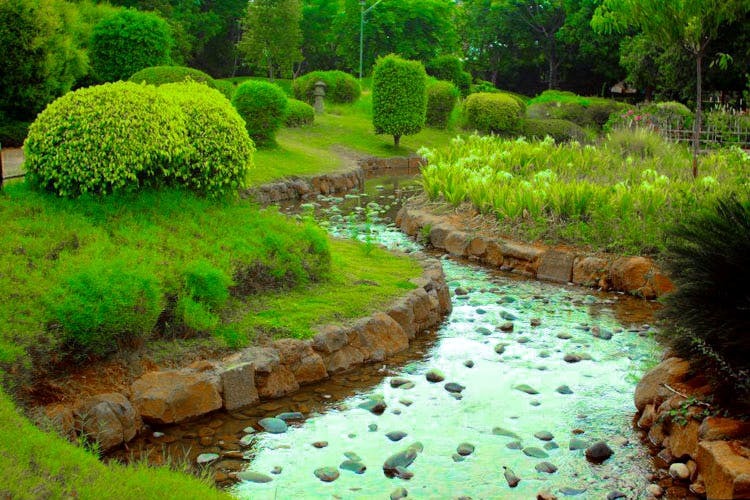 This Japanese park is also known as the Pune-Okayama Friendship Garden. With a bridge and canal right in the middle of the park that has fishes, the landscape keeps changing as you walk along. The entry fee is only INR 5 and there is a paid parking available as well. Spread over 10 acres, this park is open from 6am to 10.30am and 2pm to 8pm. Named after Major Pradeep Tathawade, this park opened in 2002. Many come here for a picnic with their kids as it has rides for young ones, while others come here to jog during the early hours or even just to take a walk and contemplate. It also has an artificial pond that has a variety of fishes. Open from 6am to 10am and 4pm to 6pm, this is the place to go to for some quietude! If you want a place for your morning exercise or just to even go out for a walk with your partner, this is definitely where you head. There are several trees here from mango, peepul, ashok and many more. Also, for the kids, it houses a small play area where kids below 10 can spend their hours and create memories. The park has a fountain and ducks and swans. It’s open from 6am to 11am and 4pm to 9pm. So, are you getting your walking shoes out yet? Just a 2km drive from the train station but a hell lot quieter, Bund garden has an abundance to offer. A jogging track has specially been added for enthusiasts. Magic shows, horse rides and bird watching are some of the common activities. It is open from 6am till 9pm. So, get a book and lay back on the grass and enjoy your day!